Currently, Shroud of the Avatar is running a test of its Free Trial System and that means you can play Shroud of the Avatar for free until July 26, 2017. Just go to shroudoftheavatar.com, create a free account, download the game, install the game and start playing. Now, if you are a Free Trial Player then you'll start on the Path of Love and the Oracle will transport you to the Battle of Solace Bridge. Unfortunately, you will start with no weapons and since you are on the Path of Love, the weapon available to you is the bow and arrow. 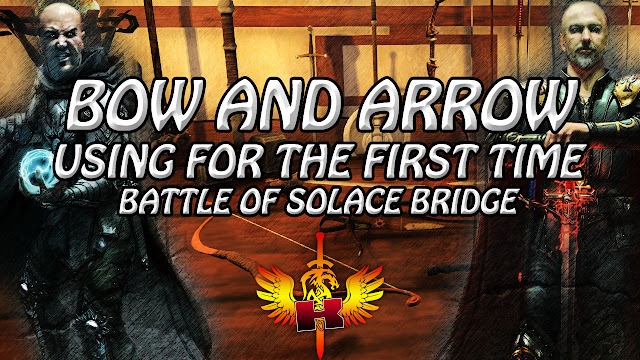 You will find some arrows scattered around the training area and you will find a bow from a dead Archer. Just pick up the bow to automatically equip it. With your bow equipped and with some arrows, you are now ready to enter Combat Mode and you can do that by pressing the Z key. In Combat Mode, you will have your Combat Bar with a couple of Skills like the Aimed Shot and Heal Skill. To start attacking with your bow and arrows, simply double click your target. To stop attacking, simply press the Escape Key. To use a Skill while attacking, simply press the number that correspond to the skill you want to use in the Combat Bar. Now, if you are still having problems or issues attacking with a bow and arrow then try restarting the game to fix it. If your problem continues then report it as a BUG in the official Shroud of the Avatar forum. You can also ask for assistance from other players or Avatars in the game or in Shroud of the Avatar's Discord Chat Channel (https://discord.gg/u4sEWws).